Always use a votive holder for votives as they as intended to melt down once they reach the middle. Trim the wick to ¼ inch and maintain this length throughout use. The best time to trim the wick is shortly after extinguishing it. Cutting the wick while it's still warm will prevent it from breaking off. Because all of our wicks are 100% cotton, they become fragile once used. This is a normal. If you choose to trim the wick once it's cool, you can easily trim the wick using your nails. Careful not to cut the wick too short; if this happens, expose fresh wick by lighting the candle and allowing enough wax to melt around the wick. Pour the wax out and relight. Burn for a minimum of 1 hr afterwards. This may develop if the candle has bot been burning long enough each burning session. 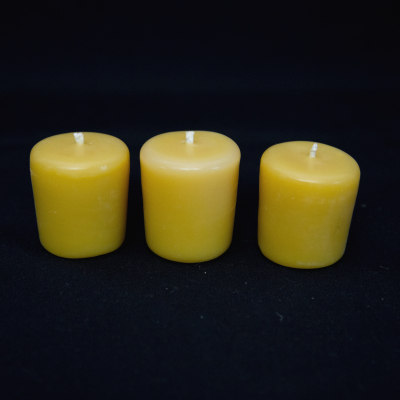 The recommended minimum burn time for our votive candles is 1 hr. To correct thick pillar walls, heat a knife under hot water and carefully cut the walls down to the wax pool. Trim the wick to ¼ inch and maintain this length throughout use. The best time to trim the wick is shortly after extinguishing it. Cutting the wick while it's still warm will prevent it from breaking off. Because all of our wicks are 100% cotton, they become fragile once used. This is a normal. If you choose to trim the wick once it's cool, you can easily trim it using your nails. Careful not to cut the wick too short; if this happens, expose fresh wick by lighting the candle and allowing enough wax to melt around the wick. Pour the wax out and relight. Burn for a minimum of 1 hr afterwards. Burn for minimum of 1hr to a maximum of 2 hrs at a time. This ensures that the wax pool has extended far enough and prevents candle from dripping along sides. Hug the sides of your candle gently toward the centre. Do this carefully shortly after extinguishing it - once liquid wax is solid but still warm. By gently folding the sides in during use, you automatically extend your candle burn time as this avoids candle tunnelling and in this case, will help avoid leaking of wax. Extinguish the wick by dipping the wick into the wax pool. You can use either a fork or a pair of tweezers to do this. 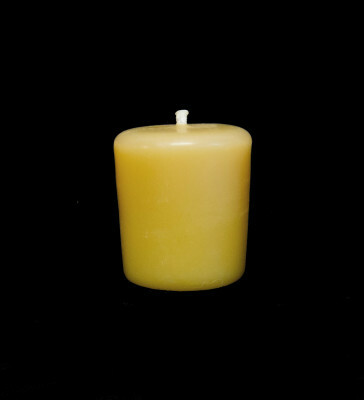 By dipping the wick into the wax, you are re-priming it for the next burn and this also prevents re-lighting issues. If the walls of your heart votive become too thin, the candle may begin to melt through the side and drip. This is generally caused by the wick being too long, creating a large flame or because the burn has extended beyond 2 hrs. Extinguish the candle, trim the wick, and let the wax cool and harden before relighting. This may develop if the candle has bot been burning long enough each burning session. 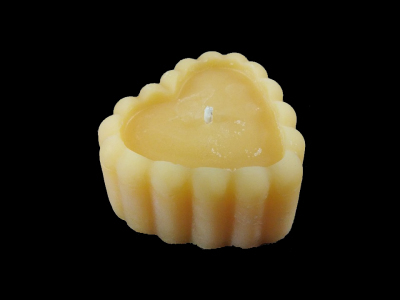 The recommended minimum burn time for our heart votive beeswax candles is 1 hr. To correct thick pillar walls, heat knife under hot water and carefully cut the walls down to the wax pool. 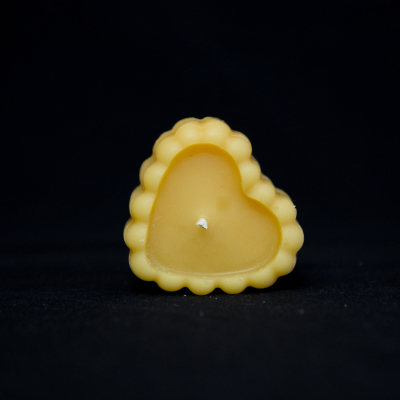 Slowly add bits of wax to candle (instead of folding sides in).